The Memorial Candle Program has been designed to help offset the costs associated with the hosting this Tribute Website in perpetuity. Through the lighting of a memorial candle, your thoughtful gesture will be recorded in the Book of Memories and the proceeds will go directly towards helping ensure that the family and friends of Ede Robicheau can continue to memorialize, re-visit, interact with each other and enhance this tribute for future generations. It is with great sadness that we announce the passing of Ede Robicheau on Friday, March 11th, 2016 at the age of 82. Our Dad was born in Meteghan, NS on March 7th, 1934. Dad was the 2nd youngest of 7 children by Mathurin and Elizabeth Robicheau. Dad met and married our mom Sheila in Halifax …….on September 15, 1953 and together with Debbie as the oldest, then Dawn, Wayne, Tammy and Sam, we became a large, happy family with lots of music, busyness and lots of lively chatter. In dad’s younger years he loved to hunt and fish, (always close to shore). Even though he was raised on the Atlantic Ocean, he was never comfortable in or on large bodies of water. He loved horses and the outdoors and was probably the first person in Nova Scotia to wear a cowboy hat, which he had ordered at that time, from the Simpson’s catalogue. It was Dad’s dream to come to Alberta. He loved western history and could almost quote word for word the history of Alberta, and so our parent’s first trip out to Alberta was in 1954 to make a new life, but times and work was scarce, so they returned to NS with Dad enlisting in the Armed Forces on March 14th, 1955. He was a member of the 1st BN (Battalion) Black Watch for the first 10 years of his military service. He was then posted to Westfalia, Germany, where we were stationed at an army base in a place called Werl. Our family spent 2 ½ years in Germany from 1959 – 1961. We returned from Germany to Camp Gagetown, NB; and then dad was posted to Calgary in January, 1965 to the 1st CIGB Headquarters afterwards transferring to the 1st Battalion PPCLI. Shortly after that, in April, 1965 he was sent on active duty to Cyprus, on a 6th month peace-keeping mission, (my mom’s worst nightmare), leaving her with the full responsibility of looking after 5 children. He ended his military service after 21 years and retired in May, 1975, in his early 40’s followed by many varied jobs, and during that time had an experience that changed his whole spiritual understanding and it changed him in many ways. While working as a security guard in the 80’s he attended and graduated from Bible College after 2 years. His last job before retiring was as a long haul 18 wheeler truck driver, after which dad became more involved in his church and became a Deacon, which was a supportive role to an elder. He then became an elder which gave support to the Pastor, until his health failed. Dad had many interests including a fascination with General Patton. He read his book and watched his movie many times and visited his museum in Palm Springs, CA more than once. Dad seemed to understand the man behind the showmanship. He was also very interested and involved in western culture. We grew up with country music, horses and watching western movies. One of his greatest movie heroes and country stars, was the team of Dale Evans and Roy Rogers and of course, his famous horse, Trigger. In their travels later on in years, Mom & Dad visited the Roy Rogers museum in CA and got to meet Roy in person. It was one of the highlights of my Dad’s life. He also became very proficient in the handling and twirling of pistols as well as the trick lasso and the bull whip. He could lasso just about anything (including our mom). 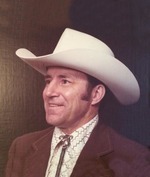 Dad was always a showman and rode in the Calgary Stampede Parade and was named Captain Canada because of his showy outfit, the unique style which he designed himself. One of Dad’s hobbies was working and tooling with leather. He was excellent at making leather wallets, belts, purses and saddles. Some of his leather work, which was placed on consignment at Tandy Leather Company, had travelled worldwide. Our Dad was very social and loved to talk to people. Another aspect of Dad’s character was that he had a generous heart for those in need and we saw him empty his wallet many times. He was also a pretty good cook and if Mom needed help he would jump right in and lend a hand. He was always baking cookies, peanut butter and chocolate chip were his favorites and ours too. As far as our family times, Dad always made sure we enjoyed our yearly family vacations; whether it was camping in Alberta or enjoying the lakes, beaches and fresh fruit of B.C. When school ended for summer holidays, we knew Dad was packed and ready to take us all on a family fun vacation. Dad, was a complex and multi-faceted man, who given the opportunity could have done many things but more importantly, chose to raise a family with my Mom. His kindness and generosities were a measure of his success. We loved him for the person he aspired to be. We will miss him and hold him dear in our hearts until we meet again. Ede will be forever loved and remembered by his wife Sheila; his five children Debra (Tom) Wenham, Dawn Wessel, Wayne (Karen) Robicheau, Tammy (Marco) Federico and Sandra Robichaud; thirteen grandchildren Justin (Robyn), Scott, Karissa, Tyler, Leighton, Matthew, Ethan, Katelyn, Katherine, Ben, Ryan, Renny and Tory; and two great-grandchildren Madison and Zac. A Celebration of Ede's Life will be held at River View Christian Church (1911-76th Avenue SE) on Saturday, March 19, 2016 at 1:00 pm. To view and share photos, condolences and stories of Ede please visit www.choicememorial.com. Arrangements entrusted to the care of Choice Memorial Cremation & Funeral Services (403) 277-7343. Hi Ho Silver, and Away!! !